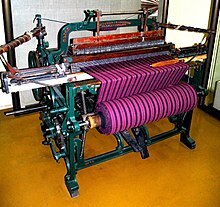 A fit-treadle operatit Hattersley & Sons, Domestic Loom, biggit under license in 1893, in Keighley, Yorkshire. A luim is a device uised tae weave claith an tapestry. The basic purpose o ony luim is tae hauld the wairp threids unner tension tae facilitate the interweavin o the weft threids. The precise shape o the luim an its mechanics mey vary, but the basic function is the same. This page wis last eeditit on 29 Apryle 2017, at 21:56.